Profile: Bongolo Hospital (Hopital de Bongolo d’Alliance Chretienne) is a 158-bed hospital, (33) adult surgery, (29) adult medical, (26) Maternity w/ (8) isolettes, (26) eye clinic, (22) Peds (medical and surgical), (5) emergency room, (5) recovery room and (4) ICU, in a rural area of Gabon. It presently serves one third of the country’s population. Current hospital physician staff includes (2) American general surgeons (both board certified), (5) surgical residents of various nationalities, (2) Congolese general practice physicians, (1) American pediatrician, (1) American IM/Peds physician and (1) American ophthalmologist. There are also three Gabonese CRNAs. The hospital also has a dental clinic, an AIDS/HIV treatment center and a busy outpatient department, with an average of 900 patients seen each week. In addition to medical care, the hospital also offers a three-year training course for nurses and midwives and a community health program. Travel: Fly by commercial airline to Libreville; fly local commercial airlines to Mouila; drive two hours to Lebamba. Time Difference: +5 hours Daylight Savings Time (EST), U.S.A.; +6 hours Eastern Standard Time, U.S.A. 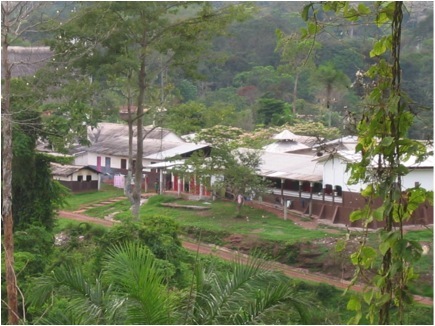 Location: Bongolo Hospital is located in a lush, forested, rural area of Gabon 340 miles southwest of the capital city of Libreville. People: French and local African dialect. All PAACS residents are taught in English. Climate: Rainy season is October through May with a slight decrease in frequency in January and February. Hot and humid (80-90 percent) throughout the year. Rainy season highs are 85 F–90 F and dry season highs are 72 F–80 F.
Housing: Accommodations are in a guest house with kitchen facilities for breakfast and lunch. Dinner will usually be with missionary staff. Food: Kitchen facilities available for cooking, some dinners with missionaries.